Life on the Ladder - 8 Consumers! Planning to write about the people and their lives back then was a bit daunting. After all, it is only my recollections and they may be faulty so how honest could I be? And then some may still be alive and their family certainly will. I don't anticipate a wide readership but who knows what may happen in the future. So do I name or not? In the end I decided I would name where I was moderately sure and the material only mildly risky. For the rest some sort of code will be applied that I understand. And hopefully only I – which means I need to keep my marbles. Ho ho. The best plan seemed to me to use the houses as a guide so I will start at the Green Lanes end on my, even side next door to the Regal Cinema, formerly Curzon, formerly Electric Picture Palace and latterly a bingo hall and now a church. Exactly what Mr and Mrs Perry of number 90 would have made of that I know not. I knew them only slightly and then more as the grandparents of a school friend X Perry. That's not his name – its all I can recall just now. He was their younger – this I know because at least one his elder siblings married and they bought the 'other' new house built on the bomb site opposite our house (owned by Jack Sleigh). The Perrys of number 90 were the age of my grandparents but fitter. I cannot recall if either still worked but I do know they were a little austere – my mum said snooty but since they treated me well enough I cannot agree. But they were not 'friends' For a start I recall they too had a telephone so need of our good offices. They did however have one distinctly dodgy feature so far as I was concerned. I had, from about age 9, a route into the Regal Cinema that by-passed the need to pay. But it required that I climb three fences and cross two gardens. One of these was the Perrys' and they were very keen gardeners. Roses in plenty I recall but lots more. For a small garden it was decidedly crowded – and very hard to cross safely, silently and without damage, especially in summer. This was made worse by the need to get from their garden into the emergency lane beside the Regal. For their fence was high and had a flower-bedecked trellis on top. The solution finally was at the very end of their garden where the trellis ran out briefly at the corner. With the use of scissors early in the season the roses could be gently and more or less invisibly cut back so that I, and later my brother and sometimes other chums, could make the crossing. We were never caught but Mrs Perry was frequently complaining about damage to her precious flower. Happily she blamed the cats. Sadly one of them was our Pip. Between us and the Perry house was 88 and in there lived The Evanses, ion lots of ways similar to us. Their garden was utilitarian though smarter than ours. They had at first frequent need of our phone. And Mrs Evans was happy, laughy, cheery and built to match. A perfect customer for Mum and her Spenser of Banbury foundation garments. So we had a relationship with the Evans that transcended ordinary neighbours. Until we had the dogs. I am only dimly aware of the schism that arose but for certain the shared access between the houses to the street and the dogs proximity to it was significant. However this made no odd to my eldest brother, Michael; who fell hopelessly if briefly in love with their daughter. I think her name was Julie or Judy. She paid scant regard I believe to me brother, even when he appeared in his Royal Engineers ceremonials. She married a Frenchman – our first experience of three things: a furrenner, a top chef and a scooterist. For George Dubouef was his name (why on earth do I remember that!) and he worked at Claridges. I now know that he was recruited by new management at Claridges to boost their reputation. He lived with the Evans – possibly as the lodger who wedded the landlady's daughter. And he travelled to London on a miniscule scooter. Basically it was a seat and tall set of handlebars joined by what looked like a lawnmower – if I then had any idea what a lawnmower looked like. The tiny fuel tank was between the rider's ankles, not knees and the whole thing was frankly absurd. (It was actually based on the 1942 to 1945 military paratroopers 'droppable' vehicle; the designer developed it as the Corgi Folding 98cc scooter; picture is of a 1954 variant. It was based on original). I think the Evans were actually very patient with my family. 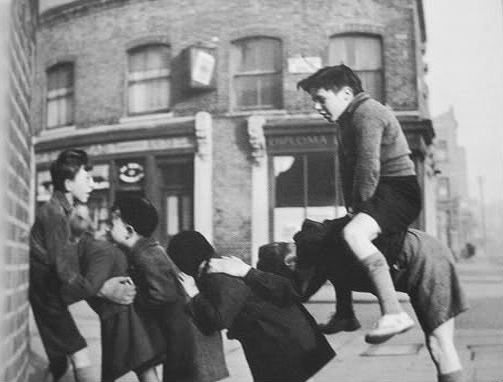 Not only were the dogs an issue from about 1947 to 1953 as they ran in our half of the sideway between the rear 'pegs' of the two houses but it was forever used by us kids for football and cricket. Ion fact we batted at the French window end which meant that the Evans bay window was precisely where any legside shot would go. We early learned to keep the ball down (by keeping the left elbow up; not seen much since |Boycott) which gave me an edge for years but restricted me to opening bat. The other side of our house, in 84 were the Sharps, the sisters Miss Sharp/ These were two elderly ladies. Spinsters as they were know then who kept to themselves. In fact they kept so much to themselves that I had only one real contact and only one real memory of them. But this was a right little earner for me from about 1950 until my brother took over in about 1958. Every Saturday, first thing and without fail I would present myself at their front door (by swinging round on a hand-rail installed for their benefit) and be handed the battery. This was a glass container, about the size of a small fish tank. Blue-green heavy glass and ribbed vertically for added strength. It had a wire cage around it and a heavy handle to carry it. The task was to ferry this object round the corner to Mr Merrills electrical shop. Here we would be given it brother, fully charged for the week ahead. It would provide the Misses Sharp with all they needed from their even then antique Murphy radio. The outbound trip and the return were mildly hazardous as the batteries were full of acid and expensive to break. On return I would hand over the battery and be given at first a threepenny bit and later a sixpence for my trouble. Few words would be exchanged beyond please and thank you. Who extracted the battery and who re-installed it I know not. I even have to assume that Mr Merrill billed the lady from time to time for charging the battery – given its wet (Leclanche I later learned) type it would need replenishing with acid for the plates to give up their electrons. That was it really. The Sharps did feed our cats if we went away. Mum knew them passingly but they were, and remain an enigma. Moving further up the road and without recalling the number there was the house of Anne Ward. She was there for most of our time. My mother knew here fairly well but I have reason to think there was once a Mr Ward (Tom rings a distant bell) but my main recollections of her house is that she let the top floor. When first I became to be aware of this it was let to police officer friend of my father, Len Pinsent. An excellent chap who gained much in my eyes by having flown Liberators in the war. He did not talk about his bombing missions much but was hugely amusing about the later years that he spent in some remote part of America desperately trying to teach US air force pi8lots to navigate by other means than swooping down and reading town names off gasholders. He had to point out the Germans were not currently being so co-operative. In fact his first experience of this was the worst – he was offered on arrival an experience flight with a senior camp officer. The US airmen took off and flew the area. When he turned for home there was low cloud. To Uncle Len's horror his chosen method of discovering where they were was to fly his open cockpit Stearman down and shout at a farmer “What's the town over there, buddy?” I never quite whether to believe him but I laughed everytime he told the story – which now I think about it was pretty often. Len played tennis as well as my father and at least every Sunday morning they would cross to the redtop courts at Ducketts where they had a two hour booking. They would thrash hell out of their racquets for four or five sets for which I was the eventually exhausted and often bruised ballboy. But Len was worth it – as was his gift of a tanner for my trouble. Eventually Len met and married a dreamily lovely girl from Loughton. Enid Taylor I think and her dad was a ladies hairdresser (not quite sure what my father made of that). Enid was absolutely delicious and not surprisingly also had wonderful dark brown hair. It was said she was a bit slow and Len made no secret of this view – he nicknamed her Dizzy but despite this she married him. My greatest thrill was partnering her in doubles but more of that anon. After Len the lodger was a guy called Towell, also a Len as it happened. And also a tennis player. So the Sunday even continued. There was one minor adjustment. While Dad and 'Pinny' were evenly matched Len Towell was of a different skill level – and could often thrash my father. He wasn't a great loser so the ballboy noticed that this happened less as time went on. Len was not around long but he took time out to teach me some good tennis stuff and I am, grateful to him. Both of these lodgers were of course also Dad's drinking buddies at the Queens Head Hotel. The next lodgers at Anne Wards were top become almost but sadly not quite lifelong friends of my mum and dad. Les and Jerry (that is Mrs) Doubtfire introduced several things to our lives beyond having the best surname I have ever encountered. And one I was not to hear until the eponymous movie of recent times. First he was a marketing man with what was called Export Bottlers but was part of the growing Guinness empire. He was the source of much Guinness and (ugh) Harp Lager and a lot more besides. But also of many promotional items that graced out house – we were never without beer mats, cocktail sticks, branded glasses, trays, branded penknives, pens, pencils – in fact anything you can think of. Mother was unnaturally proud not only of having a whole dozen Baby Cham glasses (you know, the ones with the... yeach... you know... Bambi!) and even a complete set of plastic Bambis in a variety of postures. But to be serious Les and Jerry were great chums of our household and my younger brother Roger found a fellow of his age in their son, also a Roger./ For years they were good friends and only the events of work and maturity drew them apart. Late ion the 50s Les and Jerry acquired a house a few street down the Ladder at 96 Pemberton Road but the friendship seemed to blossom. Inevitable in a way since when my mother went into hospital to barely survive a long bought of pneumonia it was Jerry who provided the breakfast, lunch and dinner that allowed dad to continue working and even visit mum in hospital. It was a kindness for which they were never fully thanked. When mum and dad quite London in 1964 for Eastbourne it was only a few years before Les and Jerry moved down to be nearby in their retirement. It is a guilty knowledge that the friendship that had been so strong was never resumed. I believe Jerry may have been very badly hurt by that. But I did nothing so share any blame. 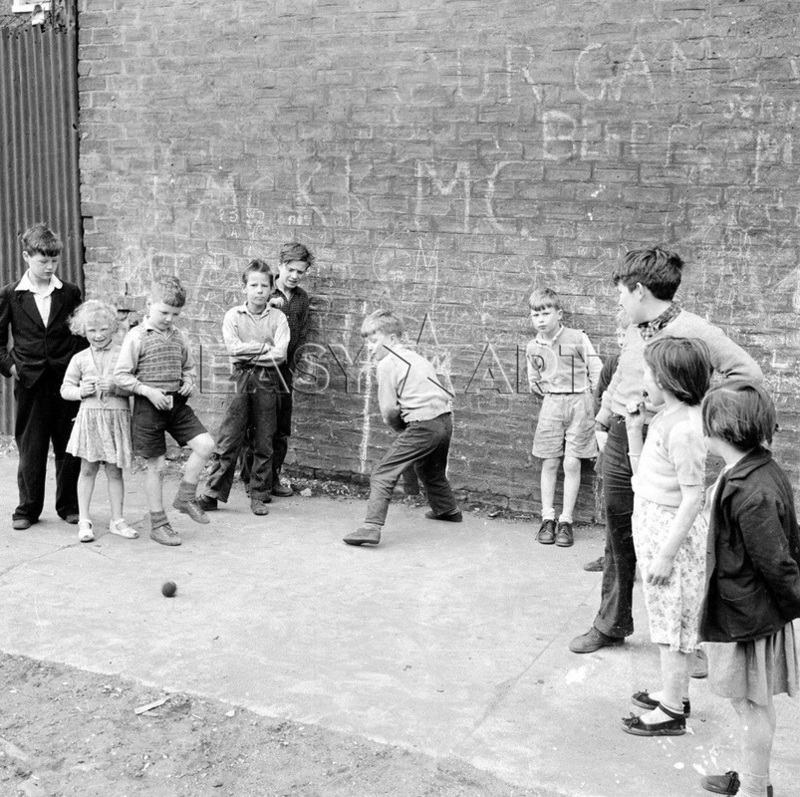 Pictures of street games seem very rare but this will serve to suggest how we played our cricket - the wall here is a lot taller than our. America this time but it serves to indicate how the motor car came to restrict our activities. 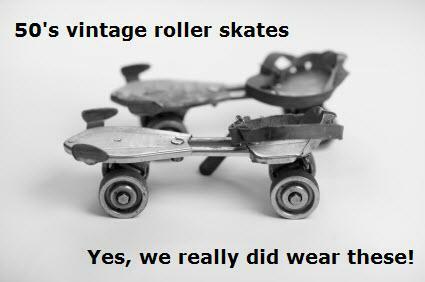 Ah the beloved Jakoskates - although these are the eventually loathed steel wheel variety. 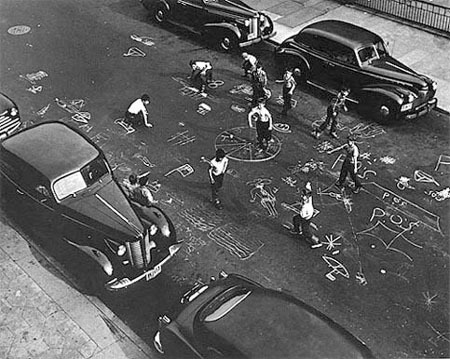 This game featured in a debate on the Harringay On Line site recently - it was we found called Jimmy Knacker. 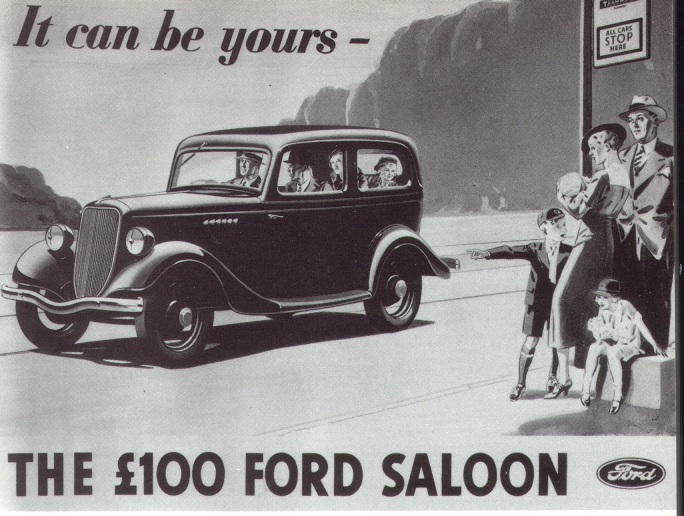 Similar to the first car in our family - the Ford 8.